We woke up to another smoggy Beijing day, although not as bad as it was 2 days ago. Our luggage had to be out in the hall by 8am for transfer to the airport but our ride wasn't until 12:45PM. Our stay at the Fairmont Hotel has been very pleasant. This is a 5 star hotel, so the room was excellent and service was great. Since internet access was not free here and we were so tired after touring each day, I had opted to wait until now to upload my blog posts. However, this was not to be. Once I got online I discovered that email access was fine but blog sites and Facebook were blocked. I would just have to wait until I got home to upload the last 3 days' entries. Instead, since I had already paid for the time, I downloaded a large part of my podcast backlog that I couldn't get through the much smaller ship bandwidth. We left the room a little early so we could get a light lunch before we left. We didn't want have to get any more local currency for food at the airport. There were about 6 other couples going to the airport at the same time as us, heading for 2 flights leaving around the same time. We were warned that the trip could take anywhere from 40 minutes to 2 hours, depending on traffic, but we made it in under a hour. The check-in process was a little different from what we are used to in the U.S. We had to show our passports 3 times and our boarding passes at least 5 times. It went something like this: 1) Show passport to get boarding passes and check luggage; 2) Show boarding pass and passport to enter secure area; 3) Show boarding pass, passport, and emigration card to Immigration Officer to get exit stamped in passport; 4) Show boarding pass to enter scan area; 5) Show boarding pass to get on airplane. In the scan area the sign said to remove laptops and cameras, so I opened my carry-on and put these items in separate bins for the scanner and left everything else in the carry-on. When the carry-on went through, the inspector pulled it aside and took our my iPad, 2 bags containing wires and chargers, my jewelry case, my headphone case and a coin purse for rescanning. They were nice about it but that was much more than TSA ever does. We were on a United Airlines flight from Beijing direct to Newark, business class so we had the fully reclining seats. This makes it much easier to sleep. This is the 3rd airline we have flown in with the sleeper seats. The first time was in an Air Canada flight when we returned from Sydney to Vancouver in 2004. 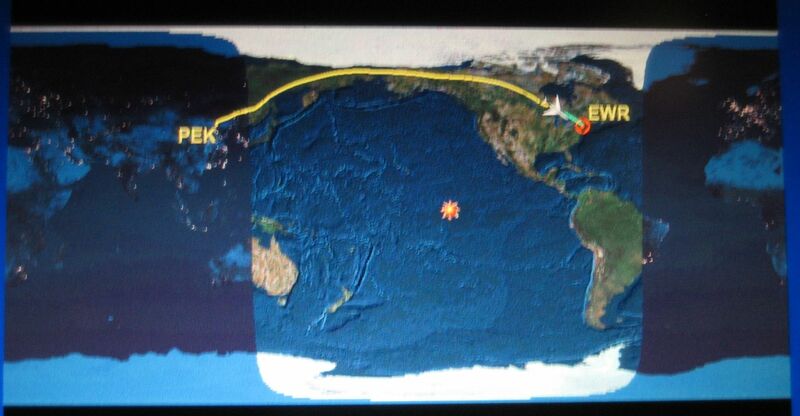 The second was this trip's initial flight from Los Angeles to Auckland on Air New Zealand. Each of these airlines has the reclinable seats configured differently. Air Canada and Air New Zealand have the seats angled individually so each passenger can get up without bothering anyone else. United has the seats in the standard side-by-side configuration so when I had to get up during the flight I had to wake Ray so I could get past him. Air New Zealand had the best set up. The flight attendant had to "make" the bed by unrolling a mattress and bedding onto the fully reclined seat when a passenger is ready to sleep, then take it up again when they want to sit up. It's more labor intensive for the flight attendant and less flexible for passengers, but much more comfortable to sleep on. The plane left the gate about 15 minutes late and there was a long line waiting for takeoff, so we took off an hour later than the published time. 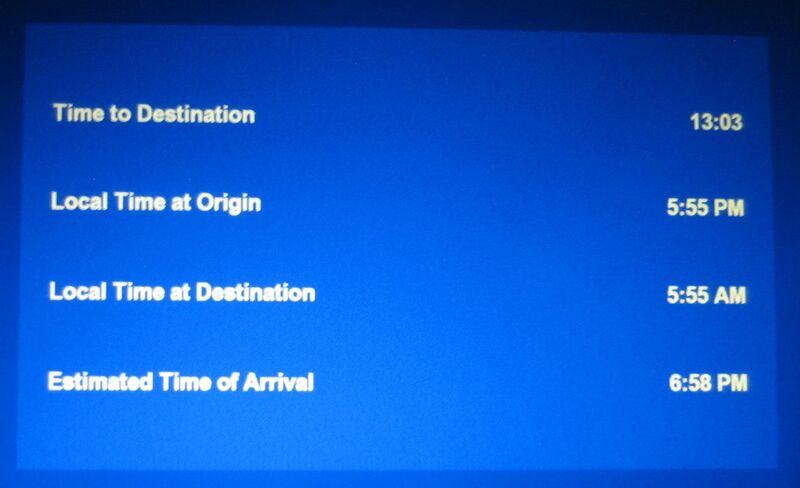 They must have calculated that in because we only landed 15 minutes late. Meal choices were not very good. There were 3 choices - steak, a spicy chicken or a Chinese dish, and the steak was gone before they got to us. We both got a few hours sleep during the flight by not reclining the seat completely. Breakfast was simpler and better. 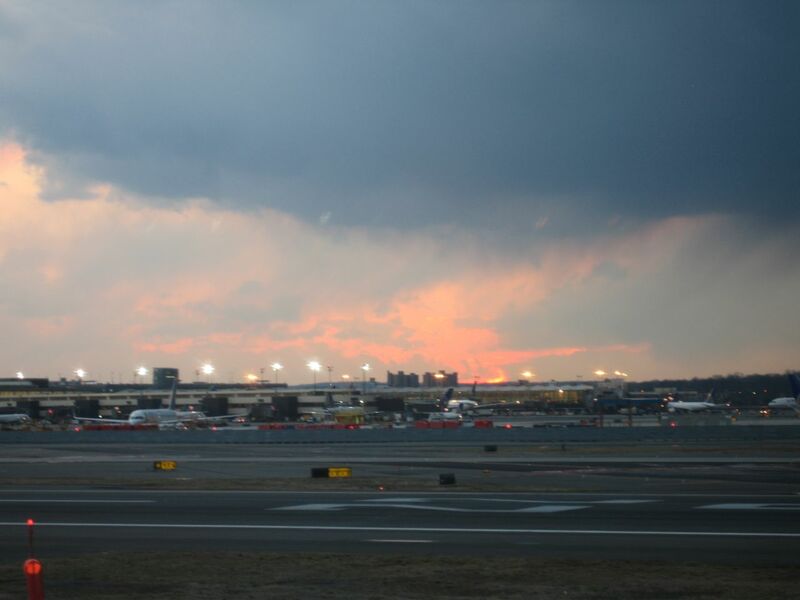 Our main concern was that we had an hour and a half in Newark to collect our bags, clear customs, recheck our bags, and make our connecting flight. I was amazed at how smoothly this actually went. They sent the bags of passengers with connecting flights out first, on a separate carrousel from the rest of the luggage. Ours were among the first to appear. It all went so efficiently that we made it to our next gate with a half hour to spare. The last challenge was getting the Village Van for the ride home. There were already 6 people in the van when we arrived. When the driver saw us with our 5 large bags and 2 carry-ons, he almost had a coronary. He didn't think he could fit it all in, but he did. We were the last ones to be dropped off and got home about 1:45 AM. That was yesterday morning. Since then we have been struggling with jet lag, trying to get some sleep but only managing a few hours at a time. We picked up our 3 containers of mail and have sorted it into important mail, things to check when there is time, and direct recycling (catalogs). All our computers needed software updates, we had about 7 loads of laundry to do, no food in the house, and the registrations had expired on both our cars, so we had enough immediate things to take care of despite our semi-comatose state. Last night we went to sleep at 7:30 PM and were both awake again by 2 AM, so today has continued to be challenging. The goal is to stay awake at least another hour tonight. This will be the last post for this blog. After this, I will go back to writing in my Life in the Villages blog. At least until our next traveling adventure.